HPWNet is an experimental wireless network developed by CSP since 2005. The project started with two aims: to develop a wireless backbone in the urban area of Turin, which can be used for the rapid activation of wireless nodes in the city and as a point of departure for extensions towards neighboring municipalities. 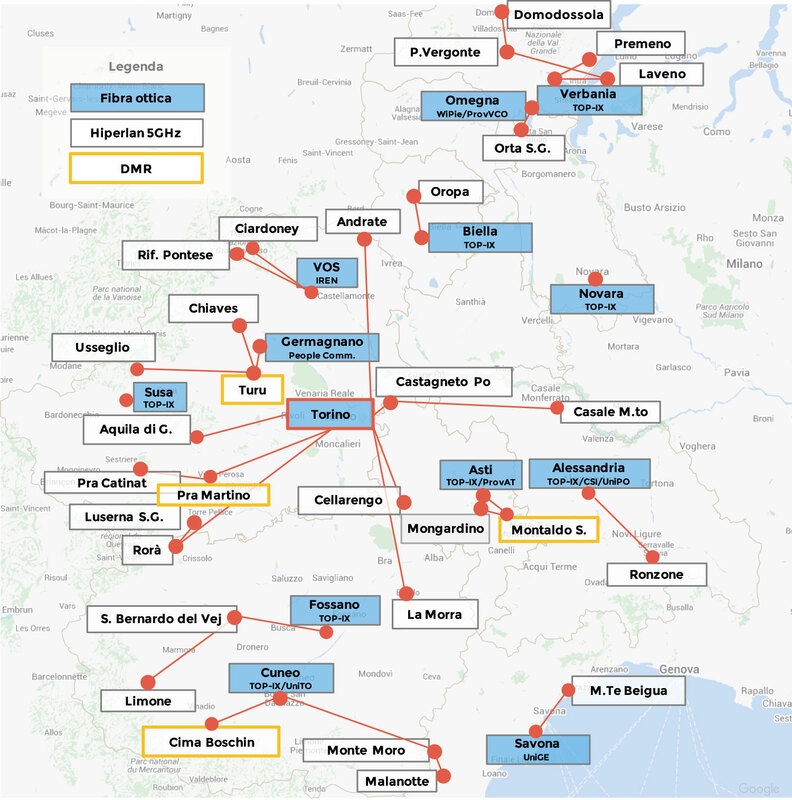 Today, HPWNet is based on 14 sites in the urban area of Turin and involves other 34 backbone nodes spread throughout the Piemonte Region. Link length ranges between 500m and 60km: HPWNet allows us to deeply analyze the behavior of wireless devices , in a real scenario with other active networks and several interferences. Moreover, HPWNet is not only an experimental network and it is used every day by several on going projects; next image shows the throughput in one of the main sites in Turin, that aggregates the traffic from several HPWNet nodes. One essential characteristic of HPWNet is its modularity: it will indeed be possible to modify the basic infrastructure to extend the network not only by adding connections to new destinations, but also by increasing the available throughput on single links by aggregating several wireless connections. at the same time means the system can respond rapidly to the requirements and operative needs of the users. Wireless link are mainly based on IEEE 802.11h and 802.11n standards. We are using devices for several vendors and also system based on Shelob platform; this open platform enables us to customize and optimize device drivers to improve performance and reliability of the system. Moreover, we can test new algorithms and protocols without the limitation of a commercial device. We also experimentally use devices that works at 17GHz, mainly to avoid strong interferences that occur at 5GHz; in the next month we plan to evaluate also 24GHz devices; we also tested TV White Spaces devices that works at 700MHz in mountain areas. We are introducing routing and forwarding protocols to maximize the overall network availability and performance and to simplify its management. First, we have evaluated and compared mainly routing protocols through emulation and in laboratory to optimize them for wireless networks.